Genetically modified rice is likely to see widespread adoption in China in the next two to three years. 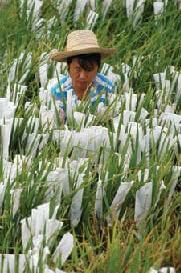 China grows a lot of rice – about 60 million tonnes a year. It also consumes most of that, only exporting around 1% of its crop. So, high demand for production with little fear of export restrictions? Sounds like a recipe for genetic modification. According to Reuters, China recently approved the commercial use of genetically modified rice and corn to be phased in probably within the next two to three years. Both strains of GM grains were created locally. Huazhong Agricultural University developed Bt rice, which contains proteins from Bacillius thuringiensis bacteria that allow it to resist the rice stem borer, a major pest in China. The Chinese Academy of Agricultural Sciences likewise developed phytase corn which helps livestock more easily absorb necessary phosphorus from feed. Experts believe that widespread adoption of the GM rice in China may lead to an 80% reduction in pesticide use, and an 8% increase in crop yield. More food, less pollution. With a promise like that, we could see GM rice spread from China to the rest of the world. Of course, genetically modified food isn’t new, not even in China. They’ve had GM papaya, cotton, and tomatoes for several years. Likewise, the United States has been a major developer of genetically modified crops. Most of the country’s soybeans and cotton are grown from GM strains that started to gain popularity back in the 90s. Bayer has developed a rice, LL rice 62, which has gained approval for cultivation in the US, but has yet to see widespread use. Reactions to GM foods ares still mixed in Latin America. Europe continues to resist adoption of GM crops, and currently only grows one major strain – a type of modified corn. China’s foray into the world of GM rice and corn could be a turning point for the rest of the globe. As the world’s largest consumer of rice, China’s choice may force other countries to consider adopting similar GM food stuffs, especially if they have any interest in selling to the Asian powerhouse. The short term benefits for China could be enormous. Most of the country’s rice is grown on small farms, and these local farmers are exposed to a variety of pesticides to maintain their crops. Bt rice will drastically reduce the amount of needed pesticides and may relieve the need to flood fields. (Flooding is partially used to reduce the prevalence of parasites.) Phytase corn will not only allow livestock to more easily receive needed nutrients from feed, it will eliminate some of the phosphorus waste present in pig and cow manure. Again, it’s hard to argue with increased food supplies and decreased environmental impact. Yet there are many who do find the use of GM crops troublesome. Many Europeans question the safety of foodstuffs that have only been around for a few years. Most of the plants that we eat have been “tested” by thousands of years of cultivation and consumption. As these crops are designed to be more successful, they can quickly come to dominate and replace the natural versions in the wild. Once enough countries go GM, they say, the rest of the world will become GM through the natural dispersion of seeds. Others point out that GM crops are the intellectual property of the developers, which have almost exclusively been large chemical corporations. Farmers are (generally) not allowed to plant their own left over seeds from GM crops, but instead must purchase seed from the developer. This is seen as an enforcement of the patent rights of the company, but there is concern over most of the world’s seed supply being under the control of a few business institutions. Finally, I worry about any process that narrows the gene pool of an important biological resource. Most commercial crops have already been bred to a very limited number of strains, restricting that down to just a handful of similar genomes seems to be asking for trouble. It’s hard to get a good idea if the Chinese are actively debating these issues as GM rice and corn are set to gain major ground in the next two to three years. Europe is likely to continue to fight GM adoption, Latin America is going to be a battle ground as each country takes its own measures to advocate or demonize GM foods, and the US…Well, strict veggie libel laws and loose labeling standards make the US a GM free for all. Few people in the states know which foods they eat are genetically modified. Again though, despite all of its critics GM food does one thing very well: it feeds people. Increased yields are going to be necessary as the world population continues to grow. Many genetically modified plants reduce the need for pesticides, which is an ecological boon. Unfortunately some are specifically designed to resist herbicides, thus increasing the use of those chemicals. It’s probably too soon to really know if GM crops are a good idea at the moment. Eventually though, I can’t see how the world will avoid adopting them. Being able to customize life to suit human needs is simply too powerful of a tool to ignore. Yes there will be setbacks, perhaps even tragically large ones, but in the end we will need to grow more food on less resources. And that probably means GM. Not just in plants, but in animals as well. We’re likely to see more GM livestock in the next decade, unless meat starts to be grown outside the farm entirely. In any case, your plate is going to be filled with food that mother nature couldn’t make on her own. Actually, for many of us, this has already happened. Science tastes good, doesn’t it?